In the last blog, I explained how I created the walls and doors of my dungeon, as well as how I added in some initial graphics to see how it all works together. The results were better than I could have hoped for, especially after I added in some optimisation, but having a nice looking dungeon isn't really much fun if the player can't see it properly, so in this weeks tech blog I'll be talking about the decisions I took for setting the view size and aspect ratio as well as the GUI layer. What size to make the rooms and the view? What kind of movement should the player have? What controls to give the user? 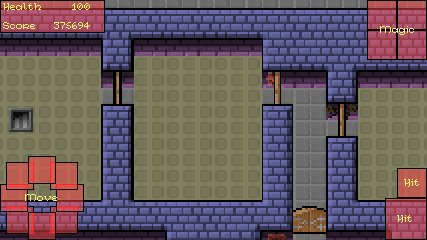 While playing with the BSP scripts I wrote for the dungeon, I'd found that for an 8x8 tile size, a minimum room width/height of about 240px gave a nice initial maze, so that decision was pretty much taken without realising it. But what about the view? I started looking at other "low-res" games to get an idea of what kind of formats people used and a lot seem to go for 320x240 (3:2). 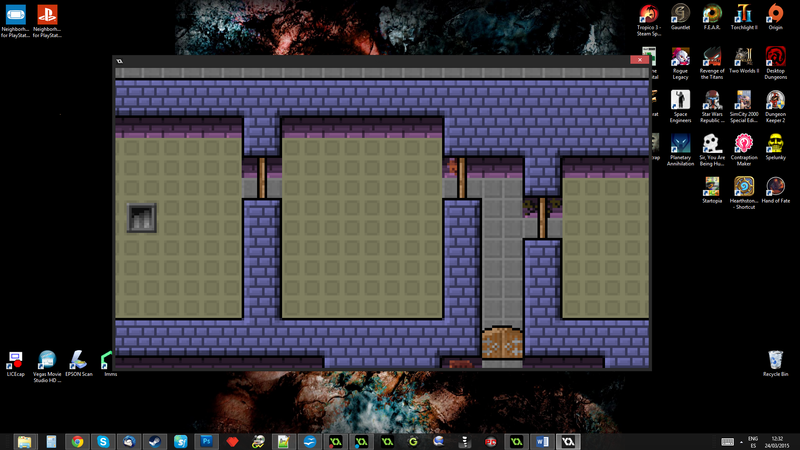 I decided to use this as a starting point for setting up the views, but after a quick initial test I wasn't happy with the view taking in the whole initial room, especially with such small 8x8 sprites - on phones, this would make everything really small! So, I just halved that again and tested with a 160x120 view. After that I simply set the view ports to the display size and the application surface to the view size and "voilà! ", a correctly scaled game that fills the screen. For desktop I had to modify this ever so slightly, however, as it would create a game window that covers the display when not in fullscreen mode, which is not what most users want when they play a game in a window! This meant that I would need to add some code to check what platform was running the game and if it was a desktop target, set the window and port size to something more appropriate. Now, I could just set the initial views to 160x120 and then set the ports to be 3 or 4 times that (giving a window of 640x480, for example), but this would then cause problems when the player goes fullscreen, as the display aspect ratio could be 4:3 or 16:9, and the 3:2 ratio that I had chosen would scale terribly. I could obviously re-enable "keep aspect ratio" and let GMS deal with things, but that would also mean a return to those black bars, which I really didn't want - AAA games don't have black bars, so I was not going to let mine be anything less! Add in a "catch" code to my game controller object that checks if the window size has changed and adapts the view accordingly. Even on the smallest monitor resolutions this should give a good sized game window, and I wasn't too worried about the differences in width between a 4:3 or a 16:9 display. Yes, those with 4:3 displays would have a "narrower" window, but I didn't think this would impact too much on the gameplay as for what I had in mind, the action was all going to be centred round the player anyway, and the limiting factor was the height, which would always be a fixed 120px. A little more or a little less on the width should make no real difference to the final gameplay and user experience, as long as a radius of half the height was visible around the player. 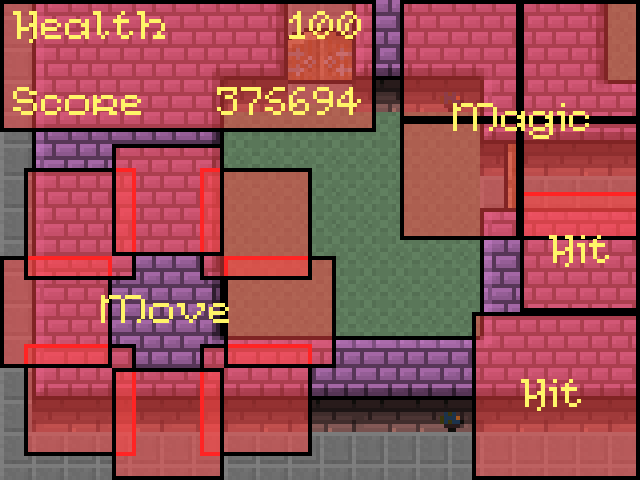 This also meant that I'd have space around the sides for the GUI elements. Since I was working on the views and presentation of the game, I also took this opportunity to set up the GUI layer, and at the same time lay out some base designs for the HUD. This may seem premature - after all, we haven't even got a player yet! - but, I was going to have to think about these things sometime, so I might as well do it now. Hopefully it would help clarify the direction of the game a bit more! So, what did my HUD need and how much space would it occupy? Obviously, I'd need some type of health counter, a score, and magic of some kind... of these three things I was certain, but what else? And in what form was the magic to take? Thinking about mobile again, I deceided to have two "magic" options, both of them simple to use but offering variety at the same time. One would be a class skill - accessible through an attack button and with a "cooldown" - and the other would be one-off "spells" that the player could pick up and use at any time. In my original homage game to Gauntlet, I had "potions" which would give the player certain abilities and powers, and I figured that something like this would be great to have in my new game too. 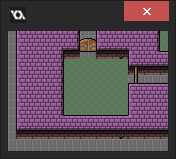 It would mean that I could procedurally add pickups throughout the rooms and that the player could use these at any time to boost their damage or get special effects. In a game like this, which is obviously aimed at the casual market, having something to spice up the action is essential, and I could scale the magic to the current level, introducing newer and more powerful spells as the player progresses. Bottom left is the touch screen controls (either analogue or virtual key - I wasn't sure yet which), bottom right are the regular shoot/fight button and the special "class" action button. Then at the top left we have the score and health, with the top right being reserved for the magic (in whatever form I decided that was going to take). The GUI layer itself is now 240px high, with a proportional scale along the width based on the aspect ratio, so the GUI was going to have twice the pixels that the game view has, which seemed like a good ratio.